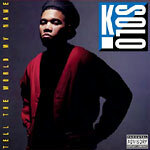 Available for the first time since its initial release is K-Solo's certified Hip Hop classic, ''Tell the World My Name''. The man who was introduced to the world on EPMD's masterful second album, ''Unfinished Business'', is deservingly given deluxe reissue treatment, packed with bonus liner notes, audio and artwork. In his own words: ''When I was younger I was in a group with Parrish (of EPMD). He was the DJ in the group and I was the emcee. He grew up and came into his own recording deal. He always remembered that I was good, and then he heard me one day during the time after I got released. He heard some lyrics and before you know it we were in the studio. We cut the whole thing for the summer in 1990.'' Considered severely underappreciated by many a Hip Hop aficionado, ''Tell The World My Name'' was a perfect marriage of signature EPMD production paired with exceptional writing from K-Solo. A well-rounded emcee, Solo didn't just make a 12-track-deep braggadocio LP, but instead also introduced listeners to his gifted story telling abilities. The re-issued CD includes the previously unreleased ''Fugitive'' (A Capella), and two very rare remix versions of ''Your Mom's''.